One of our most popular items in a long time, the Peacock Club Chair boasts a fun retro style and bold turquoise color perfect for making a statement in your home! The Peacock would actually be a great accent in almost any room, but we wanted to create a fun, eclectic living space playing off of the chair's bold motif. Our designers picture the Peacock Club Chair as the statement piece, so they opted for a more neutral sofa. 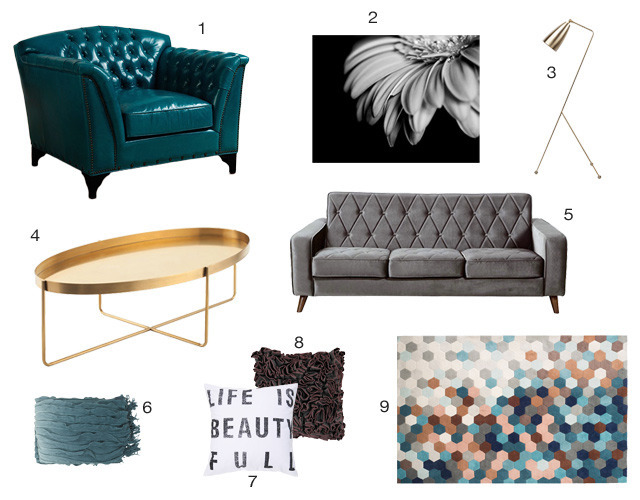 The Bowery is a perfect match, complimenting Peacock's 60's vibe with tufting, without overpowering your space. Gold and brass accents in the Gautier Coffee Table and Lucille Floor Lamp also fit into Peacock's throwback style - but as compliments, not contestants! Lastly, we really wanted to carry the turquiose throughout the room, while creating a living space that really felt livable. The black and white pillow and art, colorful rug and throw really add the pops of color we were hoping, while adding the touches that really make a home feel cozy!